This wedding was so much fun!! 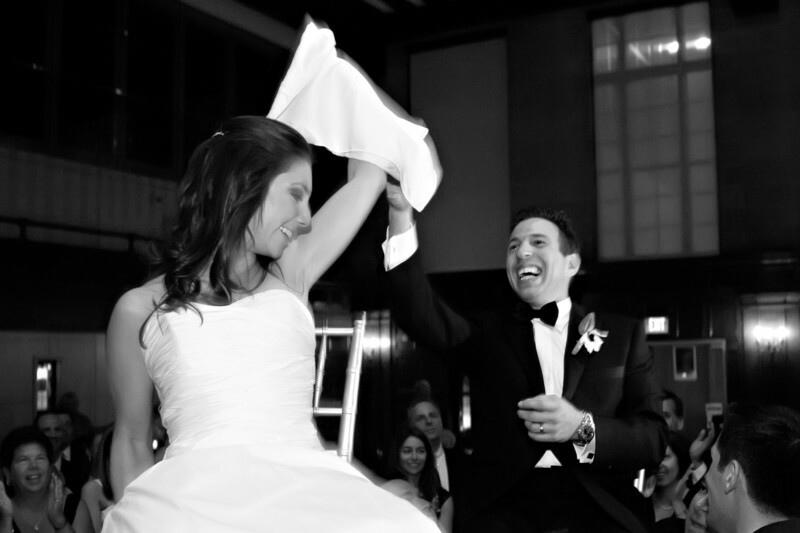 The bride and groom had the ceremony and reception at the Temple Israel in Downtown Boston. It's just around the corner from Fenway park, and I know the area well. It's a location that has amazing parking and a great backdrop for bridal party photos on the back steps. In this image the bride and groom were lifted up on chairs for the Hora. The Hora is a traditional round dance of Romania and Israel. As soon as the first few notes of Hava Nagila start, I know to brace myself to be pushed and pulled over the entire dance floor. The bridal party had them hosted up and the bride was a little leery that she was going to be dropped. When they really got going the mother of bride threw a napkin and the bride finally let go of her chair and connected with the groom. The Groom is laughing because he knows how afraid she was of falling off the chair. The room where they were having the reception is perfect for this dance as it has enough room to allow people to dance to this song. The bride and groom had a pretty big bridal party so they were able to keep this dance going with the bride and groom, and the parents of both the parents of the bride and the groom. Sometimes the bridal party gets tired after hoisting up the bride and groom, but these guys were able to keep the party going!